Extracellular fluid is the term for the many fluids that exist in an organism outside of cells of the organism, but sealed within the body cavities and vessels. Extracellular fluid that travels in the circulatory system is blood plasma, the liquid component of blood. As the oxygen and nutrients from blood are transferred out of the blood in the capillaries, these molecules make their way to another extracellular fluid that surrounds individual cells within the body. This is known as interstitial fluid, and surrounds most of the cells in the body. This extracellular fluid allows cells to carry out processes using the nutrients and oxygen provided, and to carry wastes back to the blood. The final extracellular fluid is transcellular fluid, which exists in many of the spaces in which the fluid is meant as structural support, not for the exchange of molecules. These extracellular fluids can be found in the eye, joints, and cerebrospinal fluid. In term of total volume, extracellular fluid actually constitutes a much smaller portion of the total body water than intracellular fluid, which exists within each cell of a body. This can be seen in the graph above. In all, extracellular fluid accounts for only about a third of the body’s total fluids. This is typical in humans, but the ratio may change in other organisms which have different modes of circulation. Intracellular Fluid – The fluid within the cells, also called cytosol. Transcellular Fluid – Fluid that exists in spaces used that do not receive circulation, and offer support or protection. 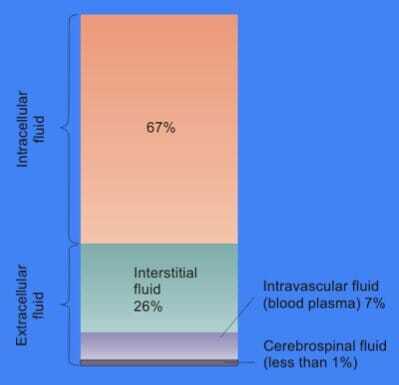 Interstitial Fluid – The fluid that bathes cells in the tissues of organisms. Intravascular Fluid – Also known as blood plasma, this is the fluid that surrounds blood cells in the blood vessels. 1. To be used by mitochondria, oxygen must make its way from the lungs to inside the cells in the tissues of an animal. Which of the following fluids does the oxygen molecule NOT pass through? A is correct. On its way to each cell, the oxygen will pass through all the types of extracellular fluid except the transcellular fluid. Plus, the oxygen must pass through the intracellular fluid in the cells of the lungs, through cells of the blood vessels and finally into the cytosol of the final cell.